At the beginning of the year, young women participate in a program called "New Beginnings". The purpose of the program is to introduce any girls who are turning 12 in the next year, as well as anyone else who is new to Young Women, to the Personal Progress program and the Young Women values. Our ward's New Beginnings was held back in February and the young women chose this year's mutual theme - "Come unto Christ and be perfected in Him" (Moroni 10:32) - as the theme for our program. I was so pleased with how Christ-centered and Spirit-filled the evening was as the young women shared their thoughts and testimonies of the values. The girls asked me to speak on the theme "Come unto Christ" and below is an approximation of what I said, based on my notes. I was thrilled when I learned that the Mutual theme for this year was "Come unto Christ and be perfected in Him." Moroni 10:32 is one of my all-time favorite scriptures (with the possible exception of Philippians 4:13 - "I can do all things through Christ which strengtheneth me") and I love that our focus this year is so Christ-centered. The invitation to "come unto Christ" is repeated over and over in scripture, literally dozens of times. The mere fact of how many times this invitation is extended should emphasize to us its importance and central position in the gospel. As I was preparing for these remarks, I took a closer look at these many invitations and I want to mention five points that really jumped out at me as I studied this message. First, it’s a universal invitation. Christ wants everyone back. No one is outside the reach of His love & grace, not even the “heathen” who doesn’t believe in God. That should provide us great comfort for ourselves and our loved ones, but it should also change the way we look at and treat other people, especially those we don’t like or don’t get along with or don’t agree with. They have the same invitation from our Savior that we do. He loves them and suffered and died for them just as he did for me and for you. Second, perfection comes through Christ, not our own efforts. Moroni 10:32 – "Come unto Christ & be perfected in Him..."
I think this is a fairly common misconception in the Church, that we do everything we can to live as close to a perfect life as possible and then Christ just puts the finishing touches on. But there is such a chasm between the best human being and the perfection of Christ that no matter how good we are we will always fall miserably short if we’re going on our own efforts alone. We need Christ desperately. He is the way, the truth and the life, the only way back to our Heavenly Parents. Third, we still have to do our part. Alma 5:35 – "Come unto me and bring forth works of righteousness..."
The fact that our perfection comes through Christ is not a free pass to do whatever we want or to ignore the commandments. We’ve been given commandments to stretch us, to help us become better, to help us be happy. Following the commandments to the best of our ability, "bring[ing] forth works of righteousness," even though we mess up sometimes, shows the Lord that we are all in, that we are committed to our covenants. Fourth, coming unto Christ requires our whole hearts, it has to be what we really want. Jacob 6:5 – "Come with full purpose of heart, and cleave unto God as he cleaveth unto you..."
The baptismal covenant as described in Mosiah 18 and in the sacrament prayers stresses the desire of our hearts, our willingness, to love and serve God and to love and serve others. 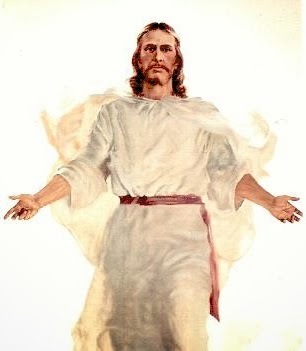 Coming unto Christ has to be what we really want; it has to be the full purpose of our hearts to cleave unto God. This is the tricky part because it’s easy to look at a checklist and go well, I’m saying my prayers, I’m reading my scriptures, I’m keeping the word of wisdom, I’m not using swear words, so I'm good! But it’s possible to be doing all the right things and just be going through the motions, to not have really given our whole hearts to God. It’s much harder to gauge how much of our hearts we’ve given to God. That’s a personal reckoning we each have to make on an individual basis. Fifth, coming to Christ provides rest for our souls. Matthew 11:28-30 – "Come unto me, all ye that labor and are heavy-laden and I will give you rest. Take my yoke upon you and learn of me, for I am meek and lowly in heart: and ye shall find rest unto your souls. For my yoke is easy and my burden is light." What "rest" does Christ give us when we come unto him? Christ doesn’t want us to live in fear or anxiety or to compare ourselves to others in either direction. We are all in need of Christ’s grace, so there’s no reason to envy others or to look down on others. Coming unto Christ gives us rest from that constant comparison with others and from the fear of not making it, as well as the anxiety of feeling like we have to do it all ourselves. Coming unto Christ is the essence of the Gospel. Jesus Christ has to be at the core of our faith. We have to choose to make Him, with His infinite love and understanding and compassion, the center of our lives. We must recognize that his invitation is to everyone and treat others accordingly. We need to humbly acknowledge that He is the only way back to our Heavenly Parents, that our own efforts will never be enough. We can show Him where our hearts are, and that we truly love Him, by doing what He's asked of us and following His example. When we come unto Him, He can give us rest from our burdens. Make the choice today to come unto Christ and to let Him come unto you.